Even though Chinese equipment manufacturer ZTE has decided to abide by the governments new security agreement, other equipment vendors do not seem to be keen on sharing their source codes and accept a penalty of 100% of contract value for security breaches. Voicing concerns of these players, the Federation of Indian Chambers of Commerce and Industry (Ficci) has written a letter to the minister of communications and IT, A Raja, the prime ministers office (PMO) and the ministry of home affairs. Rajan Bharti Mittal, Ficci president, who is also vice chairman & MD of Bharti Enterprises, has asked for an exemption of the proposal, that requires deposit of source code in the escrow account, stating that the source code is a valuable asset to the company and that escrowing of source code is not a widely accepted international business practice. The Ficci Communications and Digital Economy Committee has also asked for 90 days to demonstrate alternatives to achieve the key objectives of the government, which is the protection of network to secure information. Vendors including ZTE, Huawei, Ericsson, Motorola and Nokia Siemens Network, besides British Telecom, AT&T, Verizon, Qualcomm, Association of Unified Telecom Service Providers of India (AUSPI) and Cellular Operators Association of India (COAI) are said to be a part of the committee. ZTE has agreed, AUSPI independently said they were also not against the proposed agreement and would not be writing to the government independently. Although views of all of the members in the committee could not be verified independently, the letter is said to reflect the consensus on the issue among the members. Ficci added once the supplied products are certified by an independent agency, escrowing of source code may not be needed. Largely, the equipment vendors fear on losing out their trade secrets and intellectual property (IP) to competition, if placed in Escrow account. A senior executive at one of the European vendors, said, The government has not communicated how the deposition of source code in an Escrow account would help them reduce security threats. Moreover, we invest heavily on new technologies as compared to Chinese vendors and therefore, there is a concern on the IP being leaked. The committee has asked for a cap on the liability as a consequence of exceptional damages like special, incidental, remote damages, loss of profit, data or revenue only. However, this prescribed penalty should not be linked to every purchase order / procurement, it said. Further, the letter states that there should be a time limit in which these penalties could be executed. 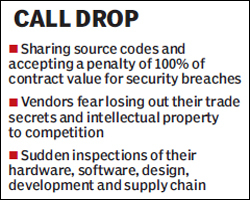 The vendors do not want the telecom service providers to perform sudden inspections of their hardware, software, design, development, manufacturing facility and supply chain, at their own discretion. Instead the vendors and service providers should mutually agree to it and the checks should be with prior intimation, it said.